Hope your all having a great Thursday - I got up this morning and thought it was Friday - so my day was destroyed before I even got out of bed ... but that's another story for another day. Currently I'm also torn between getting a new camera or paying my credit card - I know which will win - I have no will power. I really sometimes think I need professional help or someone should just take my bank accounts and credit cards off me and put me on an allowance each day. A couple of weeks ago I found a couple of YouTubers whom record games on their channel and I instantly fell in love with them (is that a weird thing to say?) They are a husband and wife duo and they play all sorts of different games and I really enjoy watching them. Recently they started recording a new game called 'Ori & The Blind Forest' which had was recently released by Microsoft on Steam for £15 (GBP). I loved their game play that much that I ended up going out the next day and buying an Xbox One and the game on the Xbox Store so I could play it ... so ultimately when my boyfriend finds out I've bought an Xbox One when I'm supposed to be paying credit cards off ... I will blame these two for this (jokes). The game starts with a rather long scene (so get some refreshment and popcorn) where there is a big storm and the screen shows a large tree with white glowing leaves and blue magic/spirit-looking stuff floating around it. During the storm one of the leaves (Ori) breaks off the tree and is blown away. 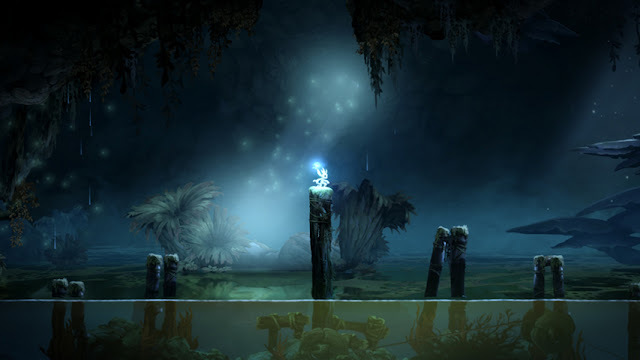 Ori (or the leave) lands near Naru (a large bear like creature) and transforms into a little white cat looking thing. Naru takes Ori in as her own and raises her/him. (According to sources Ori's gender isn't described as a he or she but for the purpose of this post I think she is a she) You then get to see them work together, play together and live together however after an event (which you find out later on in the game) happens the forest starts to die and so does Naru and Ori's food source. Sadly Naru passes away and Ori leaves to explore the foresy. She walks/crawls through the forest and also sadly passes away or collapses (it's not really clear). This happens directly in front of the spirit tree (where she/he was blown away from at the start) and the tree revives her. She then finds 'Sein' a being whom we later finds out is the heart/mind/light/being of the spirit tree and he is able to guide and protect her from enemies. He explains what happened to the forest and why it died and that they need to recover the lights of the three elements: Water, Winds and Warmth which will help restore the balance of Nibel (the forest). The tree controls the balance of all three - so once all three elements have been restored - Sein will then return to the tree and the tree will restore everything. Sounds simple right? Well there is an enemy of the spirit tree - Kuro (a crow of darkness) and we also make a friend 'Gumo' the last of the Gumon race. That's the basis of the story - I won't go into more detail otherwise they'll be no point in you playing the game. 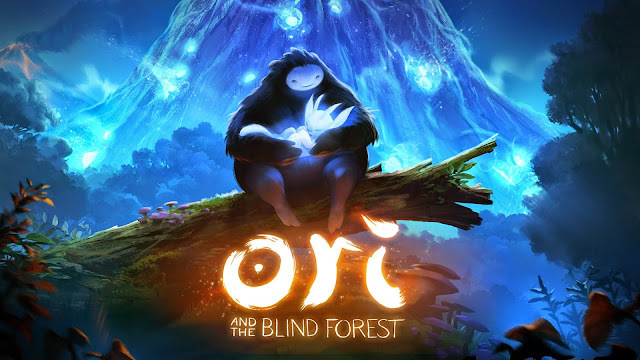 So from what I've gathered Ori & The Blind Forest was created over 4 years and inspiration was taken from a couple of games - one of them being Rayman. So I instantly knew I would love this game because I played Rayman when I was younger. It has a Rayman feel to it. 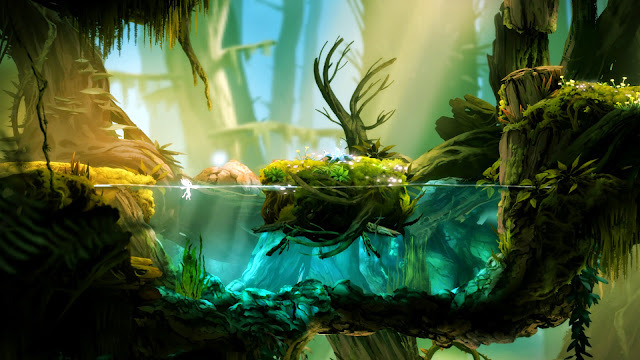 If you've played Rayman you will notice this when you play the game. The graphics are one of the highlights of the game - they are so crisp and real and for a 2D game they are absolutely amazing. 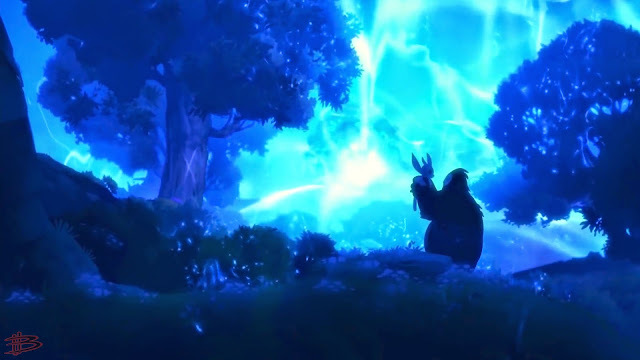 I was always taken away by the World of Warcraft graphics and I know that one of the leads on the Ori & The Blind Forest projects was a former employee of Blizzard Entertainment whom obviously make WOW. I was also amazed at the music in the game - which after some researching found out that it was actually recorded by a real orchestra. The combination of the music with the intense graphics really gives the game an edge. You can also find more detailed information on the official website HERE.